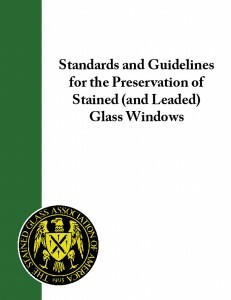 Years and the experience of many major stained glass studios have gone into the writing of this major SGAA publication. It has been designed to provide educational information to the owners and caretakers of stained glass windows – how stained glass windows are made, how they are maintained and repaired, and how they are restored. As a stained glass practitioner this publication will be invaluable to you, your employees, your clients and potential clients. Visit our website now to securely order through PayPal by clicking on this link alsdj;askdjflaksjfdlj or call the SGAA Headquarters at 800.438.9581. We will be happy to take your order over the phone accepting Visa, MasterCard or American Express. This is an excellent client gift. Large quantity orders are available through the SGAA Headquarters by calling 800.438.9581. All pricing is plus shipping and handling to your location. contact headquarters@sgaaonline.com for a price quote with shipping.